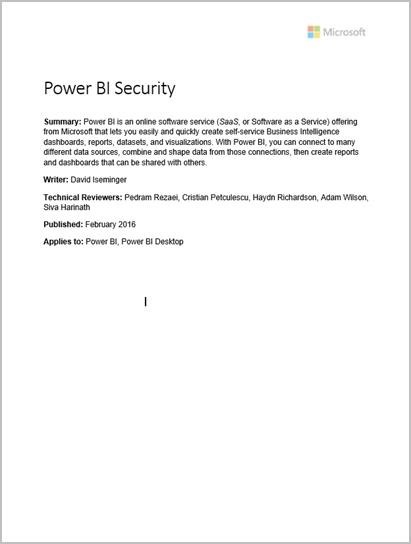 Our Power BI Security web site has been updated to reflect the new Power BI v2 as well as the new Power BI Security whitepaper that we’ve created. The dotted line in the Back End cluster image, above, clarifies the boundary between the only two components that are accessible by users (left of the dotted line), and roles that are only accessible by the system. When an authenticated user connects to the Power BI Service, the connection and any request by the client is accepted and managed by the Gateway Role (eventually to be handled by Azure API Management), which then interacts on the user’s behalf with the rest of the Power BI Service. For example, when a client attempts to view a dashboard, the Gateway Role accepts that request then separately sends a request to the Presentation Role to retrieve the data needed by the browser to render the dashboard.